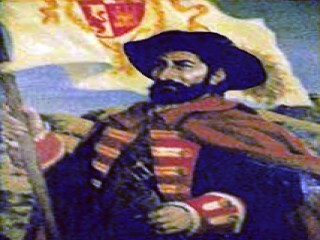 The Spanish explorer and colonial governor Gaspar de Portolá (ca. 1723-ca. 1784) headed the Spanish expedition that established the first missions in Alta California. Gaspar de Portolá was born at Balaguer in the province of Catalonia. As a young man, he joined the army and soon rose to the rank of captain of dragoons in the Espana Regiment. In 1767, as a reward for his services, Charles III named Portolá governor of Baja (Lower) California, and Portolá set out for Mexico to assume his new post. His first task as governor was an unpleasant one. The Spanish monarch had decreed the expulsion of the Jesuit order from Spain and its dominions, and Portolá was charged with removing the Jesuits from Baja California, an assignment he carried out with compassion and dispatch. About this time fear of Russian intrusion from the north convinced the Spaniards of the need to expand their settlements into Alta (Upper) California. Jose de Gálvez, visitor general of New Spain, quickly organized a plan of occupation under the overall command of Portolá. Two ships, the San Carlos and San Antonio, sailed north early in 1769, while two land parties, one commanded by Rivera y Moncada and Fray Juan Crespi and the other under Portolá accompanied by Fray Junipero Serra, left a few months later. With the Rivera party ahead to open the trail, the two groups moved north. Rivera reached San Diego in May, and Portolá's party arrived in late June. Although food was critically short and many of the men were ill, Portolá immediately set out to find the reported harbor of Monterey. Moving north from San Diego, he selected several possible mission sites, passed Monterey without recognizing the spot, and explored the region around San Francisco Bay before returning to San Diego in late January 1770. During the spring Portolá returned north and successfully located Monterey, where he and Serra established Mission San Carlos. Shortly thereafter Portolá returned to Baja California, where he remained as governor for several years. In 1776 Portolá became governor of Puebla. Probably at this time he published his Diario historico, the journal of the California expedition. Portolá served in Puebla until 1784, when he retired from active service and returned to Spain. Portolá's diary of the 1769 expedition was translated by Donald E. Smith and Frederick J. Teggart as Diary of Gaspar de Portolá during the California Expedition of 1769-1770 (1909). There has been less written about Portolá than about his more famous companion, Fray Junipero Serra. Zoeth S. Eldredge, The March of Portolá and Discovery of the Bay of San Francisco (1909), contains much interesting material. View the full website biography of Gaspar De Portola.